The remains of the old Charleston Museum in Cannon Park. Image by ProfReader via WikiCommons. If you're not from around here or belong to the under-40 crowd, you might not know the story behind those old columns anchoring the Rutledge Avenue side of Cannon Park. Or the history of the park itself. Intrigued? Read on! In the latter part of the 19th century, Bennett's Mill Pond was filled in and the area then known as Cannon Mall was to become a park designed by Frederick Law Olmstead (of the Biltmore Estate and NYC's Central Park fame). The park was never installed because the land was needed to build a structure to host the 1899 Confederate soldier reunion--a temporary structure that was built in only three months. 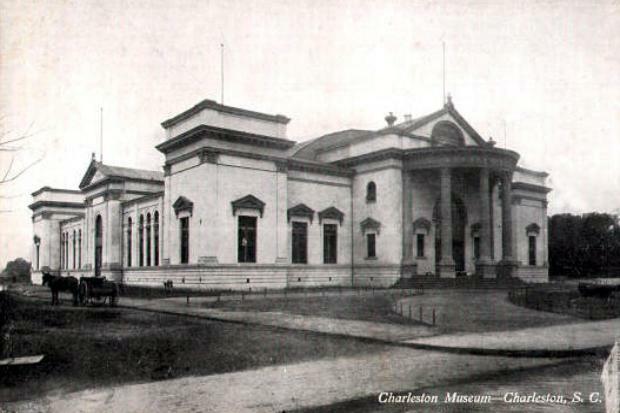 After the reunion, Thompson Auditorium was used as a theatre and temporarily housed a hospital before it became home to the Charleston Museum in 1907. But that year was by no means the beginning of the story of the nation's oldest museum. Less than 20 years after the creation of the British Museum (which served as its inspiration) and 20 years before Harvard University started its own collections, the Charleston Museum was established in 1773 by the Charleston Library Society and Charles Cotesworth Pinckney was its first curator. Advertisements ran in local newspapers asking for contributions of specimens of every kind from the area. In 1815 the collection was taken over by the Literary and Philosophical Society of South Carolina and was made available for public viewing parties (with live music!) in 1824 on Chalmers Street. After the Society was unable to procure the necessary appropriations for the erection of a permanent building to house the collection, it was moved in 1928 to the corner of Queen and Logan (then Mazyck) streets and came under the jurisdiction of the Medical College of the State of South Carolina. When the building in which the materials were housed needed to be torn down for the erection of the first Roper Hospital in 1850, the collection was moved to the third floor of Randolph Hall at the College of Charleston, where it remained for nearly 60 years as the Museum of the College of Charleston. During the Civil War, larger items were left at the College and some were even buried (!) for extra protection, but most of the material was boxed up and put in a barn in Edgefield. The barn caught fire in 1865, but thankfully only two of the 200 cases were destroyed. Although some material was destroyed in an earlier fire as well, it's pretty amazing that most of the original material is still around today! 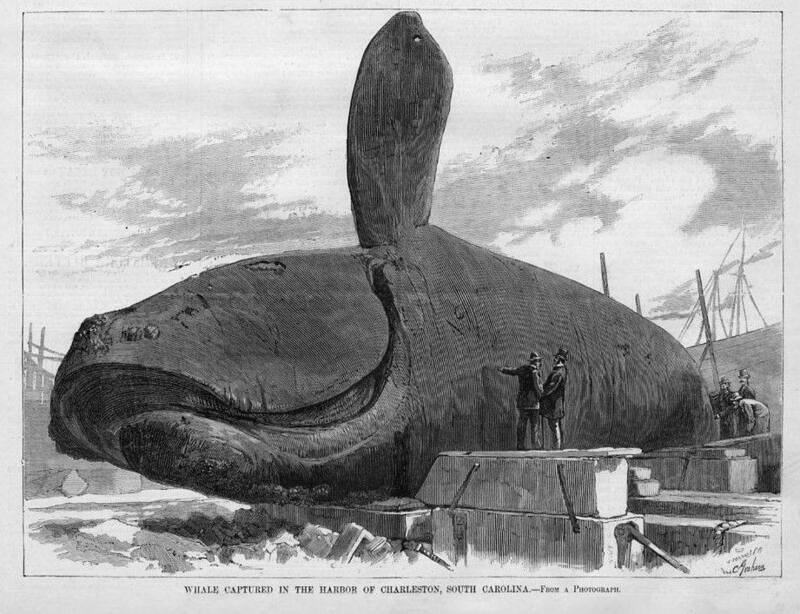 Harper's Weekly ran a story about the whale captured in Charleston Harbor in 1880. Whales, sea lions, and bears, oh my! Y'all know the story about the whale, right? In January 1880, a whale got stuck in Charleston's harbor for several days before local boatmen finally captured it and brought it ashore. The forty-foot specimen sat on display at Pregnell's Marine Wharf for a couple of days where the curious could pay 10 cents to get a look before it went to Dr. Gabriel Manigault, curator of the museum, who articulated and prepared the specimen for display. A few weeks later, a sixty-foot whale was beached at Sullivan's Island. When was the last time y'all saw a whale in the harbor here? 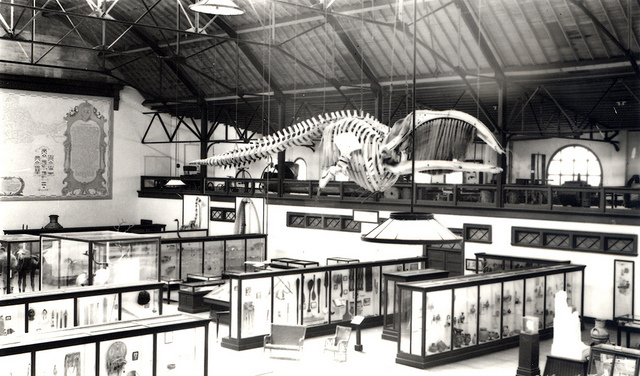 That whale hung in Randolph Hall for about 25 years, then spent the next 75 suspended from the ceiling in the old Charleston Museum on Rutledge Avenue. And now for the last 35 years, it's been on display at the 'new' museum on Meeting at John Street. Other articles of interest at the old Museum (and still on display at the new Museum) were the stuffed animals--the sea lion, seals, rhinoceros, bison, tapir, gazelle, zebra, and that Great White Bear. Oh, and we have a real 19th century mummy from Egypt, too! Interior of the old Charleston Museum, from the Collections of the Charleston Museum. In 1912, Laura Bragg, curator of education before becoming the first female museum director in the country, began a sort of travelling exhibit educational program that was the first of its kind and subsequently widely copied. She had artists create themed dioramas--"Bragg Boxes" as they came to be called--that were distributed to schools along with teaching materials. These hinged wooden boxes with built-in stages and items that could be handled were painted different colors based on their content: green for natural history and red for cultural history. She created over five dozen of these circulating exhibits and the American Museum of Natural History in NYC even incorporated Bragg Boxes into its own educational outreach programs. An honorary Charlestonian, Laura Bragg contributed greatly to the Charleston Renaissance before returning to her native Northeast, leaving a great legacy with us here. Thank you, Laura Bragg! By the early 1970s, the building atop the former mill pond was badly deteriorating and the lack of heating and air conditioning produced an unfavorable environment for the Museum's collections. Who remembers the creaking, slanted wooden floors and that unmistakable musty smell? The City successfully campaigned for a new building, which was built in brick in a controversial modern style in the late 1970s at the corner of Meeting and John Streets. Materials began moving over to the new digs in 1979, and the new Charleston Museum opened its doors to the public in April, 1980. By the next summer, the old Museum was declared a fire hazard and the City gave approval and appropriated funding for its demolition. But on October 18th, 1981, a fire that could be seen 15 miles away razed the structure to the ground. Immediately regarded as suspicious--there was no electricity or gas and the building had been closed shut for months--firefighters at the site confirmed that a previously barricaded back door had been broken into. Any evidence of arson was lost to the fire, and the case was never solved. 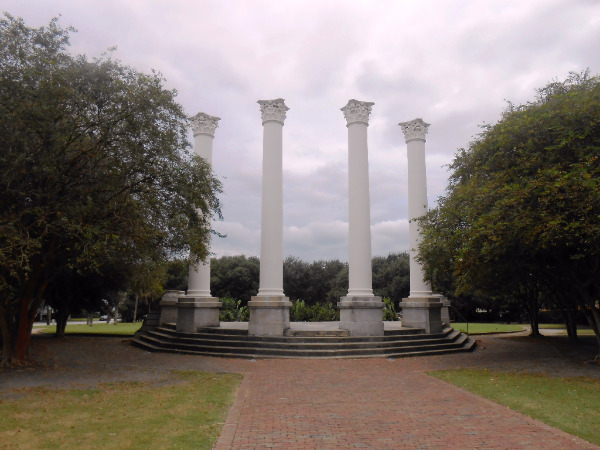 After clearing the rubble, the current park was laid out similarly to the Olmstead plans that had never been implemented, and the portico with the four columns was left as sort of a tribute to the old Museum. Such great memories! 108 Rutledge Avenue will soon be listed for sale with Lois. 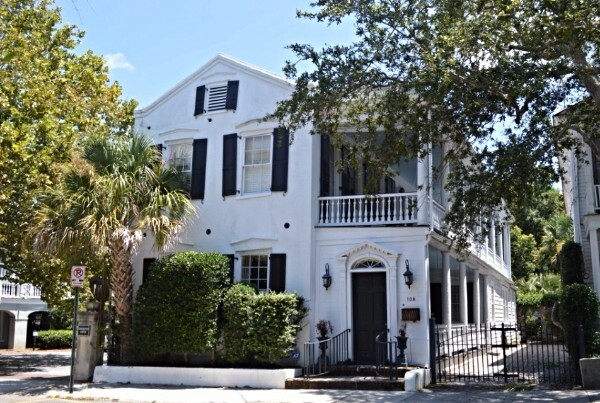 Interested in living near this important part of Charleston history? See what's available now in Harleston Village! And keep your eye out for another great home going on the market right down the street from Cannon Park at 108 Rutledge Avenue. This Charleston single house was built circa 1850 and has been completely renovated to include all modern amenities and a few nice surprises. Call Lois at 843.270.2797 or email her at lois@loislaneproperties.com if you are interested in finding out more!